New federal manufacturing equipment standards that raise the minimum efficiency standards for residential air conditioning systems will go into effect on January 1, 2015. New energy efficiency standards raise the minimum energy efficiency ratings of cooling equipment from 13 to 14 SEER. 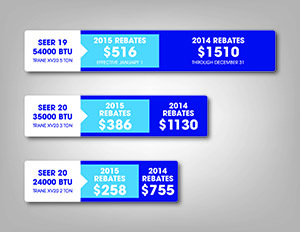 Consequently, Florida Power and Light will eliminate current rebates on 14 SEER equipment. Florida residents will also see significant cuts in the rebates they are currently eligible for when they upgrade to higher SEER efficiency ratings. General Manager of Lindstrom Air Conditioning & Plumbing, Joe Canosa, makes it clear that they support the improvements equipment manufacturers are making in their industry- while recognizing the impact this rebate reduction will have to their customers. Interested parties may contact Joe Canosa and his team at Lindstrom Air Conditioning and Plumbing directly at 954.282.7953 or for more information visit lindstromair.csadigital.com. To view the revised program standards, you may visit www.FPL.com/resacprogramstandards on or after Jan. 1, 2015.